Where are you going? On my way home to wear out the new roll of drawing paper I bought. I'm experimenting with wallpaper designs. So far, it's not looking too hot. What are you wearing? Levis high-waisted jeans, Zodiac USA boots a la Buffalo Exchange in Wicker Park, my brother's jogging beanie, a Sundance bag my mom bought way back when and a vintage Giants sweatshirt that my dad says my mom stole from him when they were first dating. Why ride? To get lost. I love adventures. And parking downtown is expensive. Favorite ride? Along the lake from Oak to Montrose at night. No one's out, it's a little scary, but everything is so peaceful. While riding you …? Hand jive when I get the chance. How can Chicago improve bike infrastructure or be more bike friendly? I'd say more bike lanes on streets like Kedzie and Ashland. Ashland especially, it's super busy, but it gets you to a lot of neat places. Also - more bike stands! I hate locking up on a bus stop. The folks at the Kinzie Chop House are super wonderful. I was on my bike just across the street waiting for the light and I guess I didn't hold my balance too well because I totally ate it and my bike fell beneath me. Then some chick told me I was bleeding inside my foot. I looked down and was like "Oh man, I am bleeding, huh.." and went flush upon closer examination. (I'm stupidly squeamish). Where are you going? I am just coming from teaching piano in the loop, and I'm meeting my two visiting cousins for some Al's Beef. For the record: delicious fries. What are you wearing? This old thing? A trusty sun dress from Old Navy (ca. 2005), barefoot Merrells, and a decrepit helmet that was recently replaced by a sweet Bern lid! Tell me about your bike, and where you got it? It's a bit of a franken-bike. The frame is from a late-80's Trek (Reynolds 531), and the components are from a Fuji road bike. I bought it through Craigslist from a man in Logan Square who rehabs bikes. Favorite ride? Well, right now I'm mainly a commuter. And this sounds silly, but the curvy stretch that connects Diversey to Logan Boulevard is an oddly open, fast little nook to ride. I utter an internal, "Weeee!" every time. My boyfriend and I are planning a trip down the coast from San Francisco to San Diego for next summer - I'm sure that will trump my little Logan stretch! While riding you …? ...I try to keep good posture. Chiropractors can get expensive. How can Chicago improve bike infrastructure or be more bike friendly? The obvious answer is to follow through with creating more protected bike lanes. The loop, in my opinion, should have more safe route options, too, since it's the hub of a city that aims to be a top bike city. One more: bike theft is also way too prevalent, and there is little to no consequence for it. Chicago needs to crack down on these thieves! And other cool, funny tips or stories? Enjoy your ride! I often have to catch myself when I get too focused on where I'm going, or on that car that got a little too close to me - how lucky am I to be able to experience a city like this by bike! I am very excited to have time again to work on Bike Fancy. I had to take the month of September off from blogging but I am back, so please check back and comment often! Make/model color of your bike, and where you got it? It's a Trek which I inherited after an old housemate left it in the basement after she moved out. After 5 years of languishing there I fished her out, fixed her up, and claimed her for my own. Where are you going? A dive bar! Why ride? I'm not super patient and I love the constant motion. I've never owned a car, and it's often faster and with less waiting around than the CTA. While riding you …? If I'm on the lakefront trail I listen to music and sing and dance. If I'm street biking I've got my helmet on, my ears open, and if there's heavy traffic I'm usually muttering "please don't kill me" under my breath. 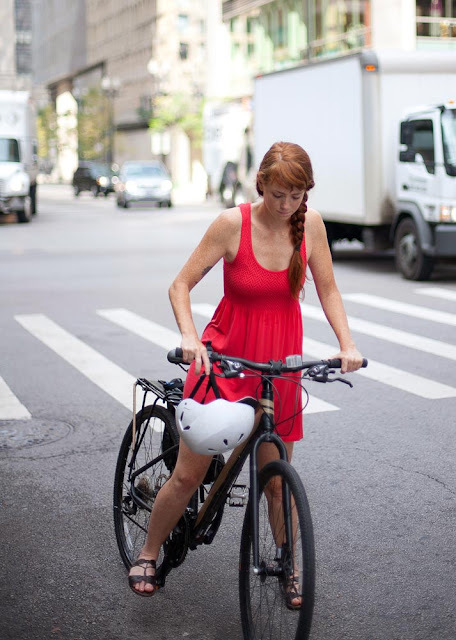 How can Chicago improve bike infrastructure or be more bike friendly? More protected bike lanes and/or lanes with fewer potholes. I got the opportunity to go all over Stockholm last summer on my bike and they have miles and miles of protected lanes, it was glorious.